One of the simplest forms of an engine is known as a Hero's engine. A Hero's engine uses heat from a fire to create steam. 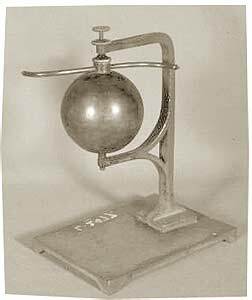 That steam is then forced to exit through a pipe or jet, which causes the entire apparatus to spin. I'm certain the design was derived from a covered pot suspended over a fire. 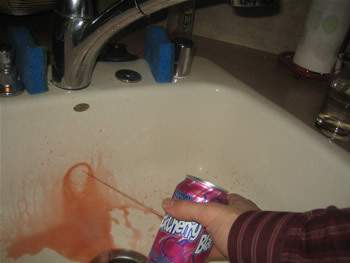 I did a little research and found that a soda can is a terrific platform for building a Hero's engine. I couldn't resist trying such a cheap experiment. 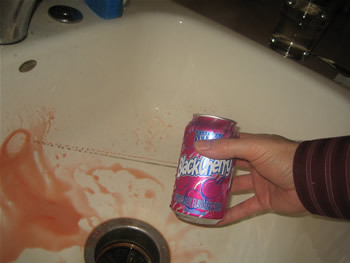 I began with an unopened can of Black Cherry Soda. I don't recommend trying this experiment with a beer can. 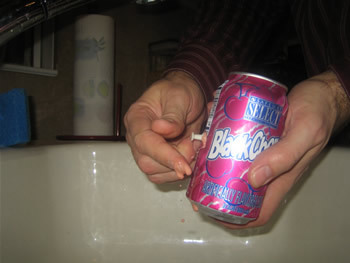 I tried it 12 different times, and each time I got started with a beer can, I became euphoric and disoriented. 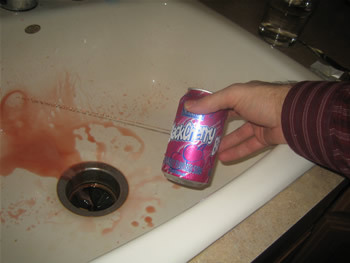 I poked a hole into the can, about halfway up the side. 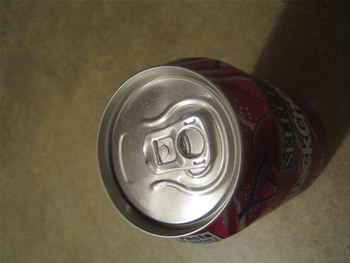 I tried to twist the pin to one side, in hopes of giving an angle to the hole, but the can was bleeding black cherry so bad, I just pulled out the pin and kept my distance. I really like how these pictures captured the high-pressure stream. This is just one version of the Improvised Super Soaker Device (ISSD) that insurgent kids use around the pool during the summer. You can almost see the inspiration for those first Pepsi-jet printers. Mine would probably still be working if I hadn't tried refilling the Mountain Dew Ink cartridge with Safeway Brand Mountain Shocker. Please continue reading page 2 of Building a Hero's Engine.